Once in a lifetime! 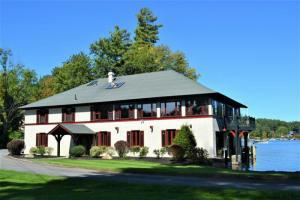 Stately expansive modern take on country manor, 13 ac on Saratoga Lake. Glass atrium, vast open fl plan, soaring great rm, kitchen w/ massive island, sep prep kitchen. Owner APT w/ lap pool. Private Guest Suites. LL w/ theater, spa, gym, huge family rm. 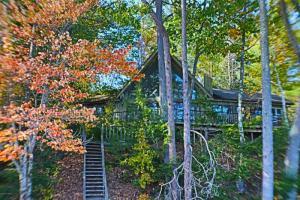 8 BD/10 BA main residence; private 2 BR guest residence via glass bridge. Gated grounds, gardens, patio/pool overlook lake; horse stables, barns, indoor riding arena, caretkr residence; boat docks; see Docs; Design by FORM Collaborative. Additional lifestyle features, such as furnishings and private boats, are available upon negotiation. 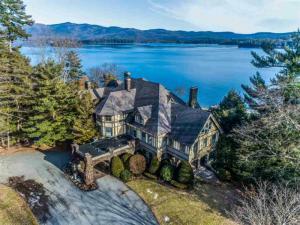 Opportunity knocks at this prestigious waterfront mansion on over 6 acres and 560 feet of shoreline located waterfront on the premier western shore of Lake George known as ''Millionaires Row''. Restore this home steeped with history and charm including heated inground pool, 2 boathouses, 10 bay/20 car garage, 4000 bottle wine room, 2br guest cottage, and you will have an estate that would be a crown jewel of Lake George. Development opportunity also abounds here. Drawings available requiring no variances. Opportunity knocks at this prestigious waterfront mansion on over 6 acres and 560 feet of shoreline located waterfront on the premier western shore of Lake George known as "Millionaires Row". 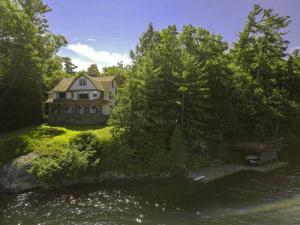 Restore this home steeped with history and charm including heated inground pool, 2 boathouses, 10 bay/20 car garage, 4000 bottle wine room, 2br guest cottage, and you will have an estate that would be a crown jewel of Lake George. Development opportunity also abounds here. Drawings available requiring no variances. 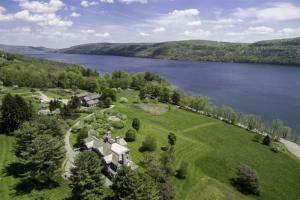 Set on 18 lush acres with Lake Otsego views sits this iconic 12,000 square foot masterpiece, known for being the original hops farm of the Anheuser-Busch legacy. “Farmlands” is a rural retreat complete with large red barn featuring 6 BR suites, gourmet kitchen, living & family room, custom carved wooden office, newly built wine cellar & so much more! Throughout the space you will find delicate molding/trim work featuring many layers, something you don't see often in modern builds. One-of-a-kind! 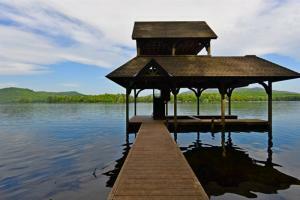 There is a large boathouse with grande ballroom above and expansive porch overlooking the lake. Tennis and volleyball courts, and 3 rustic lakeside cabins add to the expansive estate and private compound.Call for more information! This extraordinary property consists of a 13,000 SF custom masterpiece home built with high end European antiques incorporated into the structure. This home has 4 bedrooms and 6.5 baths, 42x42 open LR with a galley above, gourmet European kitchen, DR with FP, den with FP, theatre, cigar room, sauna, exercise room, billiard room, wine tasting room, casino room, and wraparound decking. The second home on the property is a completely renovated Adirondack historic inn, very tastefully done, containing 3638 SF. 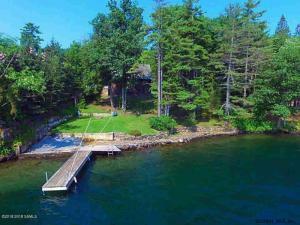 This magnificent family compound with 155 ft of lakefront on .77 acres harmonizes with the natural beauty of Lake George consisting of three residences...a custom designed home, an Adirondack cottage, and an elevated guest house built for boat and toy storage. The uniquely large dock complex with beach and storage is perfect for boating enthusiasts and offers 180 degree views of the lake and glorious sunsets. The sophisticated primary residence is 4,877sf living space and features views of the lake and mountains from every room. The main level includes a brand new gorgeous gourmet kitchen with state-of-the-art appliances, dining room, living room, family room with stone fireplace, powder room, mudroom, and attached 3 car garage. Flooring on the main level consists of 7' wide oak planks. 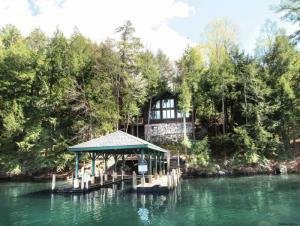 Perched at water's edge and surrounded by the natural beauty of the Adirondacks, this amazing shoreline property features 3 separate houses - the 5 BR, 3 bath main house with large deck and stunning views over the pristine waters of shimmering Lake George. 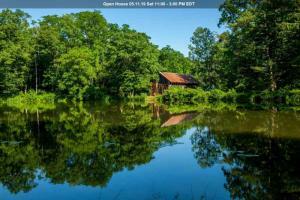 Along with a poetic and dramatic 2 BR, 2 bath Lake House right on the water and 2 BR, 1 bath Cottage. There is a large boathouse with dock and rooftop sundeck as well as gazebo, waterfall with lily pond, and fire pit for family gatherings. 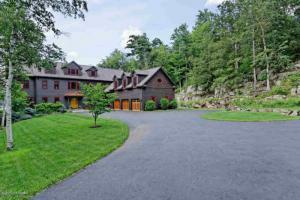 Meandering stone paths and stone walls weave through this special property in fantastic condition. Also offered together with 16 Colony Cove Road at $10,500,000. 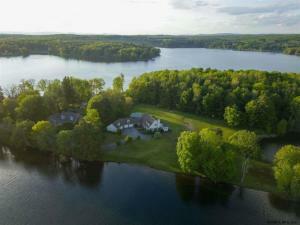 One of the most desirable lakefront settings with 328' and over 3 acres in a truly serene, wooded setting.The 5000 + sq. 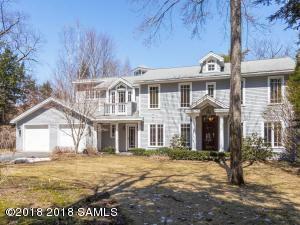 ft. estate features a stucco facade, mature grounds, 4 bedrooms,3 full baths, a gracious open front porch, three season porch, a separate 3 car heated garage with a 1 bedroom guest cottage attached. Third floor has 2 bedrooms, and an incomplete bathroom. 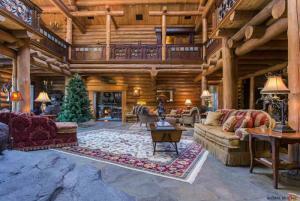 This magnificent property offers breathtaking panoramic views to the northwest. A truly special place for ALL seasons! 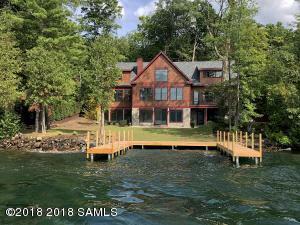 This 3700+ sf, 5BR/3.5BA lakefront home, boasts 200’ of deep waterfront and a beautiful crib dock with new sundeck and space for 3 boats on beautiful Kattskill bay. 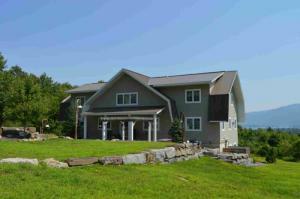 The views of Lake George, mountains, and sunsets from this 1.4 acre property are breathtaking! The Master suite is spectacular. The home also features an expansive living room area, a 12'x30' fully enclosed screened porch with new bluestone flooring great for entertaining and a 23'x23' media/game room when your done with the outdoors. Many upgrades: New septic system, new stone /custom vinyl siding, and fully automatic generator. 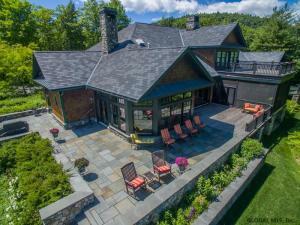 One of the Premier waterfront properties on the East side of Lake George. A short walk to the Buck Mountain trailhead for those hiking enthusiasts. SOUTHERN BASIN LAKEFRONT! 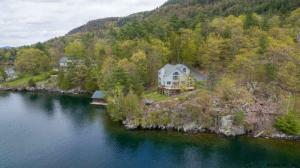 This custom-built waterfront home literally sits on the waters-edge with incredible northern views of the narrows and shelving rock. 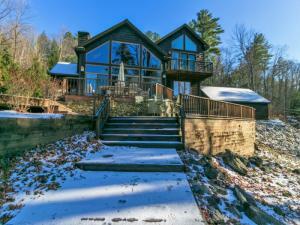 It has 110 feet of level lakefront with a large oversized covered e shaped dock complex that connects directly to the house. 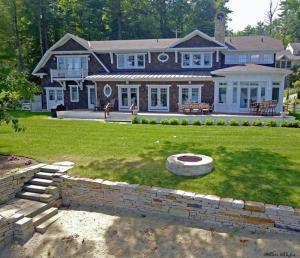 It has 4 bedroom 4.5 baths, custom gourmet kitchen with a wolf range, wine cooler and large island for entertaining. Large master suite with walk in closets and an outdoor balcony that overlooks the lake. 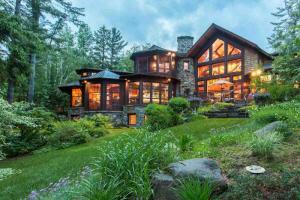 Custom stone fireplaces, hardwood floors and beautiful woodwork throughout. Detached 2 car garage with plenty of storage very private!! 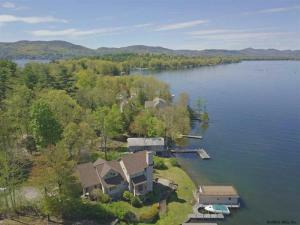 New Construction on Lake George! This custom-built home with 106ft of waterfront offers sunset vistas and Beautiful expansive views on the widest part of the lake. 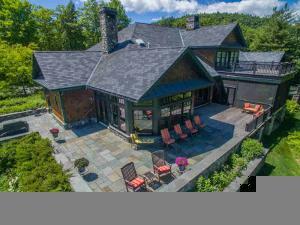 This Adirondack masterpiece has 5,746sf of living space- 4 Bedroom, 5 Bathroom home with a first floor Master suite, Great room with cathedral ceiling, Kitchen with island open to dining area. Attached 2 car garage. It is an incredibly spacious home with plenty of storage space. New U-shaped pilon driven dock, sandy swimming on level lakefront. 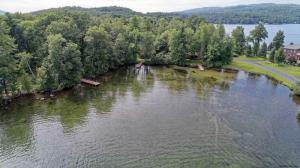 Turn-key Lake front home with private dock and custom detail. Amazing lake and mountain views! 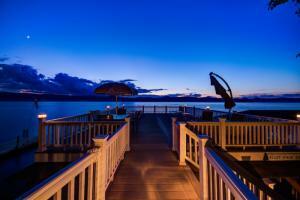 Deep water dock - expansive decks and patio! Expansive lakeside deck right off the main living space and kitchen. Large lawn to private U-shaped dock. Great main lake views and sandy swimming. 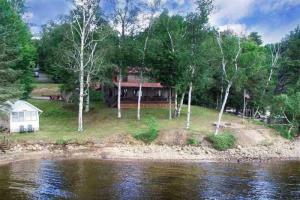 Beautiful lake front property situated on 1.42 acres with 135' of waterfront. 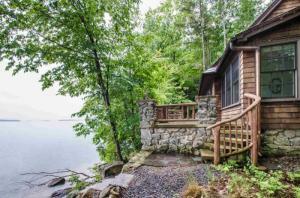 This 4 bedroom 2 bath log home is conveniently located just minutes outside of town, offers deep water frontage, and has a 2 bedroom guest cottage. 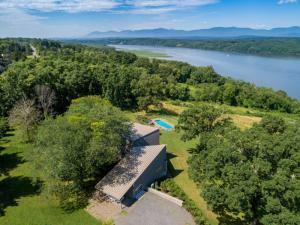 Finest quality post and beam Yankee Barn contemporary style chalet year round house.Open floor plan with three story cathedral ceiling and breathtaking views west plus lake views from each room from a bluff affording privacy and sunsets nightly. 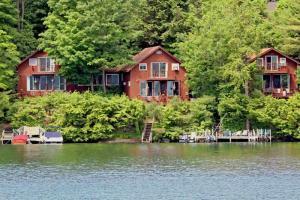 A two boat covered boathouse at lakeside has ample sunny swimming area, and extra craft docking space as well. Kitchen with new and newer stainless appliances, island and wet bar too. Tile baths, and 4 Room sleeping areas in, plus several lofts for added living space at discretion of owners. First Floor master suite. Oil fired FHA and AC.A full useful basement with shop and access out. In addition to main house, over a 3 car garage is a large apartment with 2 big Brms and bath, plus open living area & kitette. All have lake views. A rare and special beauty, this unrivaled, island work-of-art delights & spoils the lover of lake, luxury and nature. 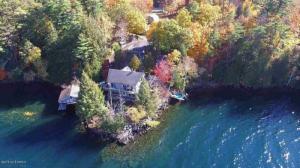 A captivating cottage, masterfully renovated in 2013, the private retreat blends lake life, wonder & excellence. From the 1st step onto the crib dock on the west side of the property, intrigue is sensed. Up steps outlined by a curved, wooden banister, past solar lights, apparent is the thoughtful care given to the journey. Arrival to the east side brings into sight the sweetly hidden cottage. Rolling open the large sliding glass doors unfolds the magic, as a massive stone fireplace, graceful white lines of unique architecture & warm light pouring into open rafters kindly welcomes friends. All who enter feel pampered. 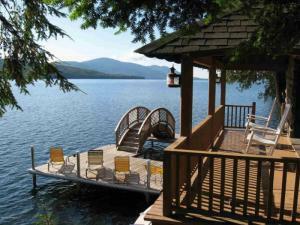 All who stay know the beauty of Lake George at its best. This private peninsula, known as Rohlings Point, offers panoramic views and over 2600' of direct lakefront on Galway Lake. The estate like setting is perfect for a retreat, a family compound or a wonderful private residence. The one owner custom home was built by Del Zotto and offers a flexible floor plan with plenty of room for extended family, guests and entertaining. Whole house generator, 4 car garage, and an additional barn/garage. If you are looking for a one of a kind amazing property-this is it! 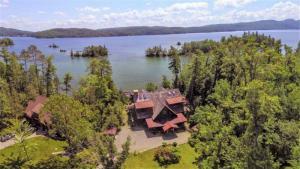 INCREDIBLE VIEWS of Northwest Bay and the Narrows, multiple docks, good swimming with 193 feet of private lakefront excellent opportunity to own 3 separate seasonal living units on Lake George on 0.9 acres. Each have 4 Bedrooms and 2 Bathrooms, electric heat and air conditioning. 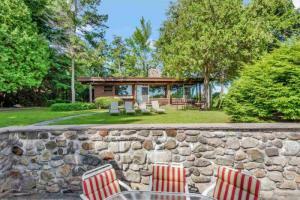 Open concept designed kitchen, dining & living rooms with sliders to lakeside decks. Lovely mountain and open lake views to the Narrows from the living areas, master bedrooms, balconies and decks. Swimming and boating are readily accessible from the docks. 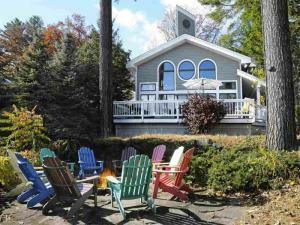 Location is convenient to town beaches, stores and restaurants in Bolton. Most furnishings included. By appointment only with realtor! A unique Lakefront property with magnificent views of Whiteface Mt., in the village of Lake Placid. 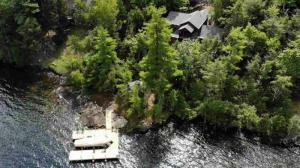 This picturesque property has 158 ft. of Lakefront on Placid Lake, 3 docks with deep water access, large in ground pool, beautiful gardens, a 3 bedroom cottage and 2 bedroom cottage. 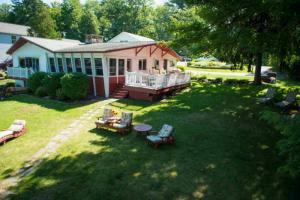 Currently, a profitable Inn & cottages, Placid Bay Inn! 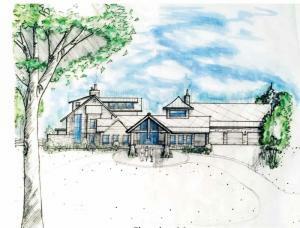 There are architectural plans converting main building to a high-end home, for the ultimate estate. This building could also be converted to a Lakefront restaurant, enjoying Lake Placid’s lucrative wedding business or develop 10 Townhomes. Schedule your showing today! This stunning, one of a kind property on Indian Lake has 400' of waterfront with docks, sandy beach and views. 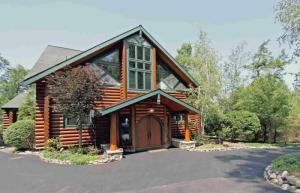 Located on 2.8 acres this beautiful property is a must have destination to unwind and relax through all seasons of the Adirondacks. Whether you are swimming, boating, reading by the water or enjoying the unobstructed stars in the night sky by the fire this property will provide years of enjoyment. 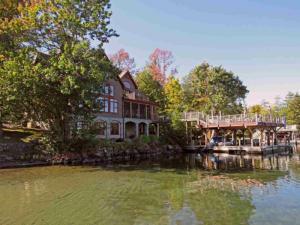 This stunning, one of a kind property on Indian Lake has 400' of waterfront with docks, sandy beach and views. 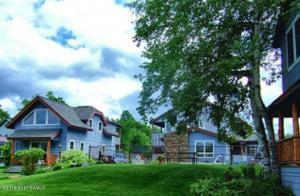 Located on 2.8 acres this beautiful property is a must have destination to unwind and relax through all seasons of the Adirondacks. Whether you are swimming, boating, reading by the water or enjoying the unobstructed stars in the night sky by the fire this property will provide years of enjoyment. The property has two drilled wells. The main house house has a walk-in cedar closet and room for a 4th bedroom.